Words by: Lindsay Robertson In the wake of their recent reunion and the release of 'Midlife' (ironically titled as it would appear that these lads have barely aged a day) it feels like Blur have never been bigger. True, in a way they have never left the music scene with guitarist Graham Coxon going on to create a string of solo albums and frontman Damon Albarn's involvement in a number of projects (Gorillaz, The Good, the Bad and the Queen and Monkey: Journey to the West). Recent performances at some of the UK's top festivals have truly struck a chord with music fans, many of whom will tell you that they'd forgotten how much they loved them. So, in this spirit we're taking a look back before Blur swept the boards at the Brit Awards with Parklife and long before the infamous 'chart war' with rivals Oasis to the band's second album. 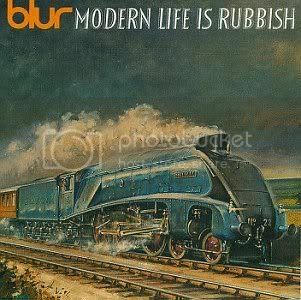 Modern Life is Rubbish was written and recorded following an unsuccessful American tour to promote Blur's debut release, Leisure. Disenchanted with the continent and all it represented to them (commercialism, grunge), the band set out to distance themselves from as far as possible from the USA. They embraced their British roots, which would become the central theme of their new image and sound. All of this was a far cry from Leisure - an album that was marketed on the tail end of 'baggy' culture. From the opening chords it's impossible to ignore the ambition and scale of this album. The anthemic For Tomorrow remains an undeniable Britpop classic. The narrative, use of characters and references to its London setting would all become common to Albarn's writing style from here on. This track sets the tone for the rest of the album - melancholic yet melodic, a bleak but fully realised insight into a scene from another life. This is instantly contrasted with the energetic riffs and frantic vocals of Advert. Colin Zeal is one of Blur's early character-based songs, painting a picture of someone through a few select traits and mannerisms (He looks at his watch/he's on time/yet again/he's pleased with himself). It is the cast of such characters which gives Modern Life and subsequent albums their vibrance and colour. Pressure on Julian brings a darker, more menacing tone to the the album (finishing with the noise of a Black and Decker courtesy of Coxon) before the launch into the punchy and upbeat Starshaped. The next track Blue Jeans has beautiful vocal harmonies intertwining with a few simple instrumental tracks. Its bittersweet feel is enough to lose yourself in entirely for the duration of the song. After this, Chemical World kicks in with its unforgettable riffs and sweeping chorus - still a favourite among Blur fans particularly at their live shows. The first half ends on the brief Intermission, a sort of ragtime piano phrase that gathers speed as it repeats before crashing to a halt. Part two of Modern Life is Rubbish announces itself with the big, brassy and ever so British Sunday Sunday - a lovable tongue-in-cheek celebration of the rituals of English life. It's followed by Oily Water, an altogether more atmospheric and surreal number with allusions to dreams of drowning. Surprisingly, the stark contrasts between tracks never seem to upset the flow of the album as a whole. The next song Miss America is more minimalist by comparison with a melancholy feel, followed by the cheery drinking song pastiche that is Villa Rosie. Coping has the same sense of panic and confusion as Advert, with Albarn spitting lyrics that only add to the chaos (Primal, evil/what am I?/Tongue tied till the day I die). These tracks reflect the torment of being lost in a mess of consumerism while the 'British' songs, gritty or satirical as they may be, certainly convey an aura of nostalgia - hence the album title. After the bouncy guitar pop of Turn It Up the album draws to a close with Resigned, a calm and reflective number that makes sense of the preceding dissarray and gathers the thoughts of the artists and listeners. Rather than being merely a criticism of elements of modern life, there is a strong sense of self awareness and strive for improvement (I think too much/about things I want too much/it makes me hateful/and I say stupid things). The album ends with Commercial Break, another short instrumental, this time guitar based. Today, Modern Life is Rubbish has taken its place as a definitive Britpop album and one that carved the way for the songs that would give Blur their immense popularity. Albarn's fondness for his home country is ever present, however his view is by no means rose-tinted as his lyrics convey a sharp biting satire throughout the album.Keeping with the central rivalry of British cultural anachronisms versus American commercialism, every track has a flipside and its own significance to the relevant theme. Not one song would have been better left off the tracklist, even the instrumentals serve the purpose of book-ending each half of the album. Overall, it is a prime piece of British guitar pop, innovative in its structure and concept and boasting some of the cleverest lyrics of the genre.